Dear all, together with rising popularity to Olympic city, Pyeongchang, many celebrities visited Pyeongchang. Shall we take a look? Celebrity Bromance is a variety show broadcast on MBig TV , available to mobile users. Celebrity Bromance portrays star friendships, and is filmed the “paparazzi – style” from a distance to allow the cast members to feel less overwhelmed by cameras. For Episode 1 to 3, top K-pop idols, Sungjae (BTOB) and twins, Gwangmin and Yeongmin (Boyfriend) visited Pyeongchang. 3 cute best friends enjoyed Sky Ranch and Alpensia Ski Jump Tower. Let’s take a look on the moment they visited Alpensia Ski Jump Tower and how “beagle-beagle” they were in Pyeongchang! The Return of Superman is the reality-variety show featuring celebrity dads who take care of their children for 48 hours alone. In episode 167, the brainy baby star, Seungjae visited a traditional market with his dad and enjoyed snacks in Pyeongchang. The buckwheat pancake that Seungjae tried in the stall of the market is a signature item in Pyeongchang. 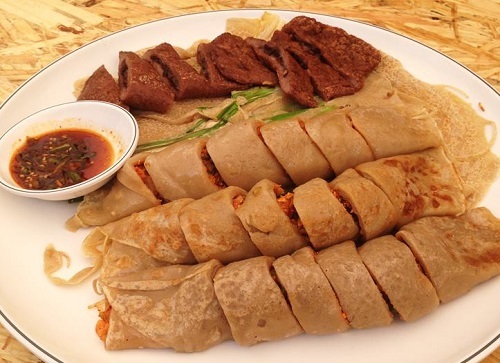 Pyeongchang as a hilly town is the perfect place for buckwheat cultivation so Pyeongchang people have invented many dishes of buckwheat such as buckwheat noodle, buckwheat pancake and even buckwheat tea also! Buckwheat pancake is a pan-fried thin buckwheat dough filled with spicy kimchi and other vegetables inside. It tastes go good together with simple flavored buckwheat dough and spicy filling inside. Look how cute Seungjae enjoys talking with a grandma and eating pancake! The last celebrity visited Pyeongchang is Park Bogum, the new rising star! 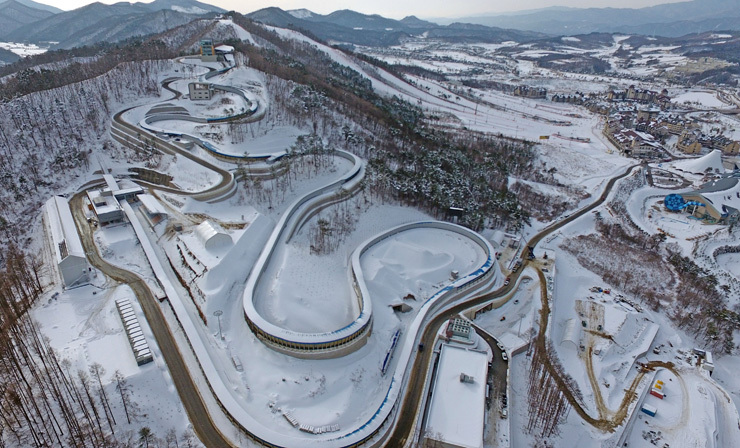 In the special episode of Infinite Challenge, <2018 PyeongChang>, he participated in one of the Olympic sport game, bobsleigh in Alpensia Sliding Centre. How did you like your celebrity in Pyeongchang?